Singing Bible songs for kids is the greatest way to help them memorize God’s wonderful Word, the Bible. The Scripture Lady is a pro at helping kids hide God’s Word in their hearts! “LOVING” is a sweet little Bible song based on Psalm 62:12, which says, “You, O Lord, are loving!” Our kids need to hear that God loves them very much regardless of their behavior. God loves his children on their good days AND bad days. Scripture Lady’s Bible songs for kids are great for Sunday School classrooms, home schools or any children’s ministry! You, O Lord, are loving. Here is a Bible verse song for John 14:27 that I call "Do Not Be Afraid." It is a very sweet song with a lullaby feel. It beautifully describes the wonderful peace that Jesus wants to give each and every one of us. My very first musical Bible program for children was called "The Fruit of the Spirit" and I wanted to include a Bible verse song for John 14:27 to showcase the fruit of peace. John 14:27 says this: Peace I leave with you. My peace I give to you. I do not give as the world gives. Do not let your hearts be troubled and do not be afraid. This is definitely one of the most beautiful verses on peace. What a wonderful Savior we serve! And how blessed we are that we can trust in Him at all times an not be afraid. Click HERE if you would like to purchase your own digital copy of this Bible verse song for 1 John 3:1 along with the complete video of the moves for only $2.49. Click HERE for a Free pdf file that will give you the Bible Verse Word Cards for John 14:27. Looking for a fun game to help your kids learn more about John 14:27 and His peace? Mark 12:30 encourages us to love God with all our hearts. Our hearts are the storehouse of all our feelings. Here is a fun Bible game for Mark 12:30 to help your preschoolers learn how to love and trust God with all the different feelings they have such as happiness, sadness and excitement. In my preschool chapel program called "Loving God and Others," I get to teach the children about the wonderful Bible verse of Mark 12:30, which says, "Love the Lord your God with all your heart, with all your soul, with all your mind and with all your strength." Try playing this fun Bible game for Mark 12:30 that I call "Which Feelings are They Feeling?" Here is a video that explains how I play this game: &lt;span data-mce-type="bookmark" style="display: inline-block; width: 0px; overflow: hidden; line-height: 0;" class="mce_SELRES_start"&gt;&lt;/span&gt;&lt;span data-mce-type="bookmark" style="display: inline-block; width: 0px; overflow: hidden; line-height: 0;" class="mce_SELRES_start"&gt;&lt;/span&gt; Click HERE if you would like to purchase the downloadable files for this game to present your own Bible game for Mark 12:30. Want to make your own game from scratch? Then follow the directions below. For this game, I am giving you six short little stories about 6 different children. Each story shares a different emotion. The stories are written below. When I present this game, I show the children 6 pictures of different children and number them 1 - 6. Each picture shows a child showing one of the 6 different emotions in the stories found below. You can gather 6 pictures and place them on a pocket chart or on a table so all the children can see them. Anna's teacher was teaching her how to skip across the room. But Anna was confused. She didn't know how to make her feet move the right way. Jack was building a skyscraper with his Leggo's when his baby brother toddled by and fell right on top of his building. Jack was so angry. It was bedtime, but Levi was scared of the dark and asked his grandma to leave the hallway light on. Emma had a favorite doll, but she couldn't find it anywhere. She became very sad and started to cry. It was Sam's birthday. He was so excited to open his presents. Then his aunt came in with a present that was making noises. When he opened it, he was surprised to find a new puppy inside. Yesterday, Jailyn's mom and dad came home and announced that they were all going to Disneyland on Saturday. She was so happy! If you would like to teach them a Bible song for Mark 12:30, check out this sample video of "Heart and Soul." &lt;span data-mce-type="bookmark" style="display: inline-block; width: 0px; overflow: hidden; line-height: 0;" class="mce_SELRES_start"&gt;&lt;/span&gt; Click HERE if you would like to purchase your own digital copy of this song along with the complete video of the moves for only $2.49. My Fruit of the Spirit song is one of the very first Bible verse songs I ever wrote and it is still one of my favorites. The kids love when I sing this song along with my fun Fruit of the Spirit boards and my bopper. Add these creative props to your own worship or teaching time in your classrooms or homes. 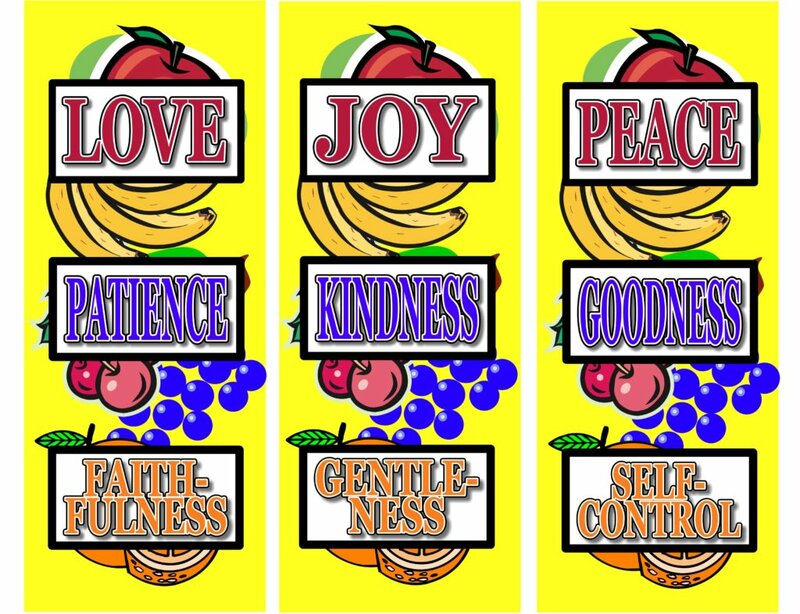 The Fruit of the Spirit song comes from Galatians 5:22-23, which says this: "But the fruit of the Spirit is love, joy, peace, patience, kindness, goodness, faithfulness, gentleness and self-control." Learning the Fruit of the Spirit should be a goal for every one of us, especially for our children. Whether you are a parent or teacher, you can have lots of fun teaching these great Bible verses to your kids. And whatever version of a Fruit of the Spirit song you use, with a little help with some creative props, your children will have all 9 "fruits" memorized. Prop #1: Fruit of the Spirit Boards When I sing my Fruit of the Spirit song, I use some boards that have all 9 of the fruits listed on 3 separate signs that look like this: I made my boards nice and strong so that they would last a long time. You can make your own boards by following my design above. For this song, you will need to pick 4 kids to "be on stage" with you. You will give the first 3 kids one of the boards to hold. The fourth child will hold the Bible in their hands. 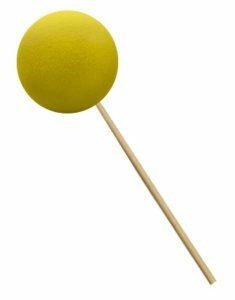 You, the teacher, are in charge of the bopper. As you sing the song, you will lightly bop each of the sign holders on their heads, while standing behind them, indicating that they are to turn one full turn around as fast as they can. I created the boards so that each "fruit" in the song gets its own "bop." When you sing the reference to the song, Galatians 5:22, you will then bop the child holding the Bible. This is the cue for all the class to get out of their seats and turn around along with the child holding the Bible. That's it! It's simple and very fun. Props can make a BIG difference in your children's ministry! Click HERE for a sample of my Fruit of the Spirit song. 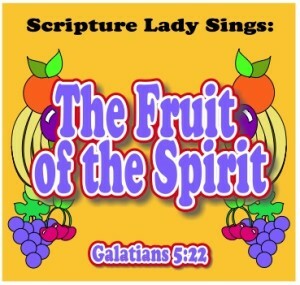 Click HERE if you would like to purchase the downloadable digital file for the Fruit of the Spirit song for only $0.99. Click HERE if you would like purchase all 75 of my downloadable Bible verse songs for only $9.99. 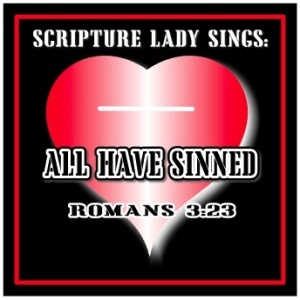 Singing a Bible song for Romans 3:23 will help your kids learn the truth about sin. This well-known verse says that "all have sinned and fall short of the glory of God." Use this Bible song to help your kids memorize this verse and hide it in their hearts for all their lives. As Christians, we all know that sin is the most serious of topics. However, I actually had fun writing a Bible song for Romans 3:23. I needed to write a Bible song for Romans 3:23 to fit into my "Wordless Book" program. The Wordless Book is a very simple tool for evangelism. It takes the five colors of Black or Dark, Red, White or Clean, Green and Yellow or Gold to explain the Gospel of Jesus Christ on a very elementary, yet effective, level. I have a Bible song that correlates with each color. The dark color represents sin and Romans 3:23 is the perfect verse to teach about sin. I love Child Evangelism Fellowship's definition of sin: Sin is anything I think, say or do that displeases God. Kids need to recognize that they are sinners and that Jesus gave His life to take the punishment for their sin. So, I wanted to write a song that was both upbeat and truthful. How did I go about that? Well, I thought of good old Elvis Presley. When I picture Elvis, I think of him in his black leather jacket and slick backed black hair. Before singing the song, I tell the children that Elvis was a pretty cool guy and a great singer, but he was also a sinner just like you and me. He did wrong things sometimes and the wrong things he did were sinful. I then proceed to bring out a pair of cool black sunglasses and then I teach them the moves to the song. Click HERE if you would like to purchase your own digital copy of this song along with the complete video of the moves for only $2.49. Click HERE is you would like purchase this song as part of my "75 Downloadable Songs Package." Want a fun Bible memory verse game to help your children learn Romans 3:23? Then click HERE for "Missing the Mark." 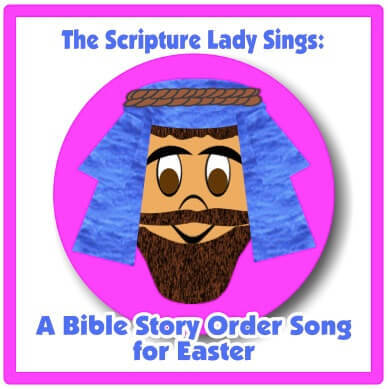 Try using this "Bible Story Order Song" for the Easter Story to help your children learn about the main events of this amazing historical event. 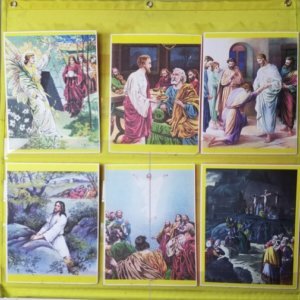 Your kids will learn about "The Last Supper," "Jesus in the Garden," "Jesus on the Cross," "Jesus in the Tomb," "Jesus Rises from the Dead," and "Jesus Ascends to Heaven." Last year, I wrote a chapel program simply called, "Let's Learn the Easter Story." I wanted to write a song for the Easter story that would help the kids learn about 6 of its most important events. I decided that using my "Bible Story Order Song" format would be just the ticket to introduce all 6 occurrences. 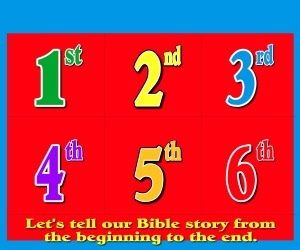 When I use my "Bible Story Order Song" format, I use a banner I created called my "Bible Story Order Banner." 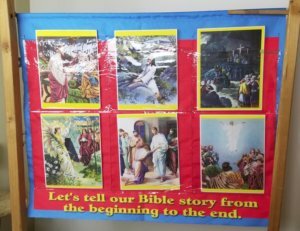 It's a banner that has 6 pockets which holds 6 pictures that showcase the events of any Bible story. Next to the banner, I have a pocket chart that holds all 6 of the pictures. While I sing the song such as the song for the Easter story, I am showing slides on my Power Point for the kids to match with the correct picture on the pocket chart. I "pause" the song and let a child come up to the chart and find the picture that we just sang about. He then places the picture on my "Bible Story Order Banner" in the correct order. Here is a picture of the "Bible Story Order Banner" completely full with all 6 pictures. Click HERE if you would like to learn how to get your copy of this downloadable song of the Easter story along with the downloadable pictures and the downloadable videos of the moves. Click HERE to learn how to get one of my fun Bible review games that will teach your kids the importance of Easter. It's called the "3-2-1 Game" - Three Crosses, Two Choices - Which One will YOU Make? Here is a fun song about Palm Sunday for kids to learn more about this great day from Harry, the gentle donkey. Below, you will find the lyrics for this fun song all about Palm Sunday for kids sung by Harry, the gentle donkey. 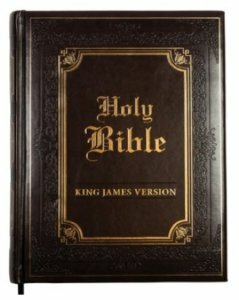 If you’d like more great ideas for your kids that share the Bible, go to www.scriptureladyshop.com for creative resources for your children. 1. My name is Harry the donkey. I'm a young colt that's gentle. It's true. 2. I was munching my hay on a Sunday when two men came up to our door. My master asked, "What do you want?" "We need Harry for our Lord." "We need Harry for our Lord." "We need Harry for our Lord." "We're doing as Jesus our Master has asked." "We need Harry for our Lord." 3. Two men then walked over. They looked at my mom then at me. Our eyes grew wide and our ears stood tall. Now there were new things to see. The men placed cloaks upon our backs. Jesus sat on me happily. Jesus sat on me happily. Jesus sat on me happily. I felt like I was holding a king. Jesus sat on me happily. 5. Then something wonderful happened. I heard people shout and sing. They waved palm branches high in the air. They called Jesus their blessed king. They called Jesus their blessed king. They called Jesus their blessed king. Hosanna to the Son of David, Jesus their blessed king. 6. Some men in the crowd were angry wanting people to stop and not shout. But Jesus said with authority, "If they're quiet the stones will cry out." "If they're quiet the stones will cry out." "If they're quiet the stones will cry out." Jesus proclaimed like a king in command, "If they're quiet the stones will cry out." 7. Soon the celebration was over. I was back home with my family. I'll remember this day as long as I live; the day I carried the King. The day I carried the King. The day I carried the King. Jesus rode upon my back. I know He is the King of kings. I LOVE creating fun Sunday School ideas for preschoolers. Here is a sweet poem and game that you can play with your preschoolers to help them learn how God uses our family members to teach us about His love. "Grandma's Breakfast Table" comes from my own childhood memories of a loving grandma who always did her best for us. When I am writing Sunday School ideas for preschoolers, I will often go back to my own childhood and remember what it was like when I was growing up. Though times have changed, there are things that still remain the same such as the loving hands of a grandma. My grandma was cherished by my sisters and I. Every Sunday morning we would all go over to her house and have a lavish breakfast made by her loving hands. Would I have loved her less if she just always gave us "Pop Tart?" I don't think so. But because she put so much time and effort into her breakfasts out of her great love for all of us, I do believe I love her more. Last Mother's Day, I was able to create a new Bible Song Program for preschoolers called "Moms in the Bible." While the focus was on mothers, I thought it would be nice to include grandmothers. So, I wrote up a sweet poem based on my memories and turned the sharing of the poem into a fun Bible game. I am providing you with the poem below in case you would like to include it in your own Sunday School ideas for preschoolers or during your chapel time or family devotions. CLICK HERE to learn how to purchase the Downloadable Visuals for "Grandma's Breakfast Table." Poem for "Grandma's Breakfast Table"
We'd visit my dear grandma whose breakfasts were the best! Let me tell you about each one. I really think I should. First there was the milk and juice. Oh, I love that orangy smell! And milk was very good for me. It made me feel real swell. Grandma never forgot the fruit. She thought green grapes were great. I always liked all the fruits' pretty colors showing bright on the plate. Grandma loved each one of us. Of this, there was no doubt. For each item on her table showed us what love was all about.